Shopping centre only a 1min walk over the reserve, Fully equipped kitchen, Newly decorated with everything you need for a comfortable stay. Taupo is an amazing and beautiful place, winter and summer, with something for everyone. 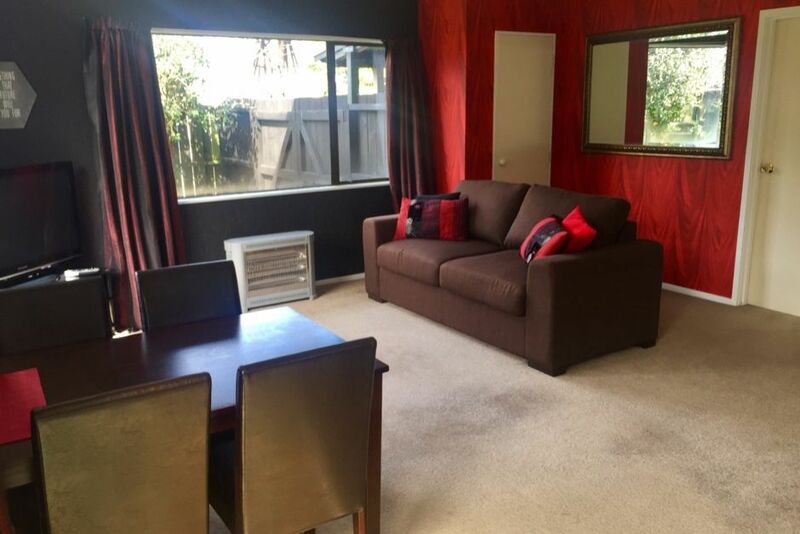 This Bach is best suited to a couple or couple with kids, if you are after something abit bigger please check out our other listing! Please note that we have two Baches on this site and although they are completely seperate, own access, self contained and will not effect your stay we ask that you please respect other guests if occupied along with close neighbours. Smoking allowed but outside only. Deposit required to secure your booking. please ask about our weekly stay deals!! Modern very tidy flat close to town and lake. A super quiet location, nice comfortable batch and a private back garden for our use. The batch met all our requirements. Lovely. Great location, clean house and great environment. Comfortable and quiet in a suburban street. Comfortable and quiet in a suburban street. Nice outdoor area and kitchen/dining/lounge. Quiet. Great little good value property for two. Jaime was excellent and responsive to deal with in our last minute booking. Nice location and cosy place to stay.